pArts: Villazon ain't done yet: Not even close! 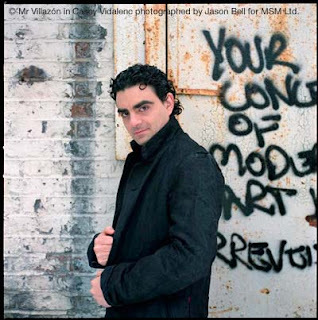 Villazon ain't done yet: Not even close! Good gravy some people really do enjoy nothing more than jumping to conclusions. Villazon returned to the opera stage a month or so ago singing magnificently two major roles: Lenski and Nemorino . . . and to outstanding reviews, sold out houses and enthusiastic audiences. I've been lucky to hear two of those performances, as well as some of the recent Handel outings which he's currently touring. I heard him as recently as last night and the voice is in fine shape, with a thrilling, pulse-pounding way with difficult florid passagework, his coloratura not always perfectly even, but measured and full of ping and yes, some hypermusical instincts. when there are plenty of working tenors who would love to have this facility and tone quality. I simply don't get the twisted logic of the doomsayers who love to express "concern" that he's destroyed himself and believe they know the singer better than he knows himself. Remarkable. references Hugh Canning's "review" which, like the article itself, spends most of its paragraphs setting up and tearing down its subject before ever critiquing a single note of music. cancelled many lucrative engagements. As Brecht wrote: 'First comes food, then morals.'" Yes, Rolando has been starving to death and just out to earn some scratch. Right. unleashed energy that has most audiences exploding in cheers. Yes, yes, I know, people are idiots and don't know any better. Not in London, nor in Paris, Munich . . .
Of course Canning spends as much time talking about how he "feels" Villazon looks uncomfortable - but I find he's mistaken the tenor's naturally manic, hyper-animated stage manner for "discomfort" when it's simply not the case. No one (I believe) says the same about Ms. Bartoli and her similar frenetic stage energy, but with Villazon it's a different story. Here's Rolando as Lenski, singing "Kuda, kuda" only a month ago. It took my breath away. If this is the end of a career than "oops, wrong planet" - black is white, up is down and wrong is right. You decide if, along with Mr. Canning, he is nothing more than a cash cow "alongside the Bocellis, Jenkinses and Pottses of this world," and if it's time to for those who "care passionately about opera will shed a few furtive tears over what might have been." Like him or not I sense Rolando is on the right track and I, for one, couldn't be happier. Long may he sing!